Following the retreat of General George Washington's Continental Army northward from New York City, British General William Howe landed troops in Westchester County, intending to cut off Washington's escape route. 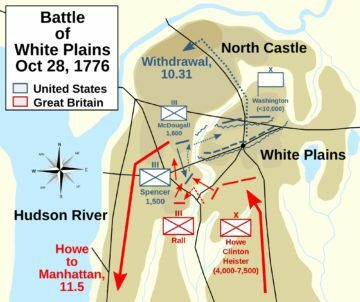 Alerted to this move, Washington retreated farther, establishing a position in the village of White Plains but failed to establish firm control over local high ground. Howe's troops drove Washington's troops from a hill near the village; following this loss, Washington ordered the Americans to retreat farther north. Later British movements chased Washington across New Jersey and into Pennsylvania. Washington then crossed the Delaware and surprised the Hessian troops in the Battle of Trenton. Armies - American Forces was commanded by Gen. George Washington and consisted of about 14,500 Continentals. British Forces was commanded by Gen. William Howe and consisted of about 14,000 Soldiers. Casualties - American casualties were estimated to be 300 killed/wounded/captured. British casualties was about 313 killed/wounded/captured. Outcome - The result of the battle was a British victory. The battle was part of the New York and New Jersey Campaign 1776-77. After the Battle of Long Island, the British army forced the Americans off of Manhatten Island. Howe pursued Washington slowly out of New York City into the countryside. Howe extended his own command in a line running from New Rochelle in the south to the village of Scarsdale in the north. Howe and his Tory sympathizers had a stronghold in New York City. At the urging of the Continental Congress, Washington had to leave some 2,800 troops, commanded by Colonel Robert Magaw, to occupy Fort Washington and another 3,500 troops under Major General Nathanael Greene to defend the opposite shore at Fort Lee. Their mission was to disrupt and prevent the British fleet from moving upriver above the forts and into the Hudson River Valley. 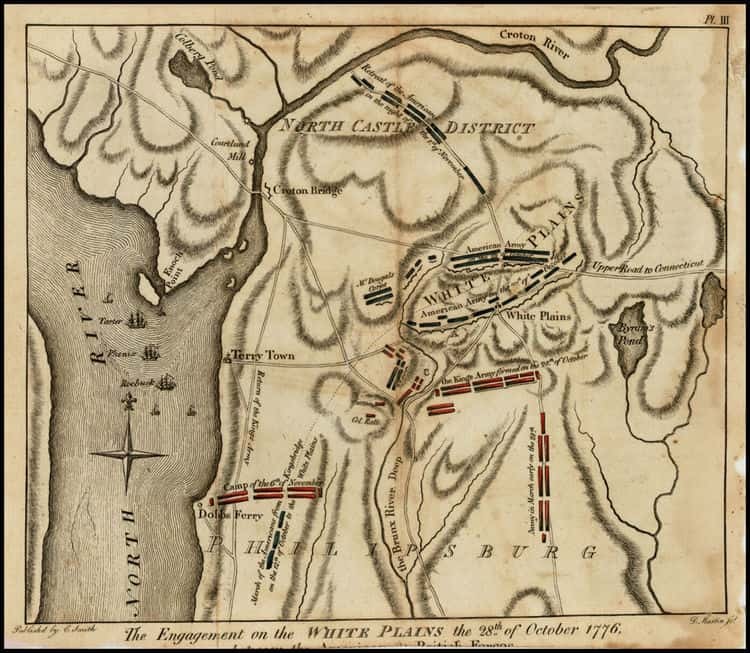 On October 22, Washington and his army arrived at White Plains. They joined their advance unit, which started arriving the day before, and began fortifying the three surrounding hills. At White Plains, Washington deployed his army along a width of 3 miles, including passing through the town. The right flank was commanded by Brigadier General William Heath, the center was commanded by Washington, and the right flank was commanded by Major General Israel Putnam. Howe was at New Rochelle, were he was not in any hurry to move against Washington. This gave the Americans time to arrive safely at their new position. On October 23, about 8,000 Heissens, commanded by Lieutenant General Wilhelm von Knyphausen, arrived at New Rochelle and reinforced Howe's army. Howe decided to leave some 4,000 Hessians to garrison New Rochelle. Washington's conclave double-line front covered the town of White Plains. Facing south, the American line was anchored on the right flank (west) on Purdy Hill along the Bronx River and on the left beyond the town on Hatfield Hill near a large pond. The center was directly in front of the town. Beyond Washington's right, about a half mile on the far side of the river, was Chatterson's Hill. Initially, Washington did not percieve the hill as important enough to occupy. 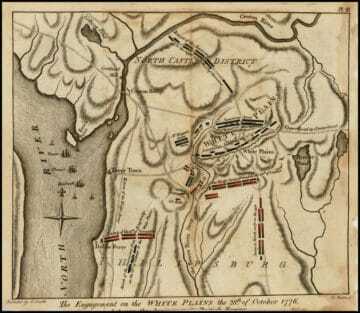 On October 28, in the morning, the British entered Scarsdale and advanced towards White Plains. 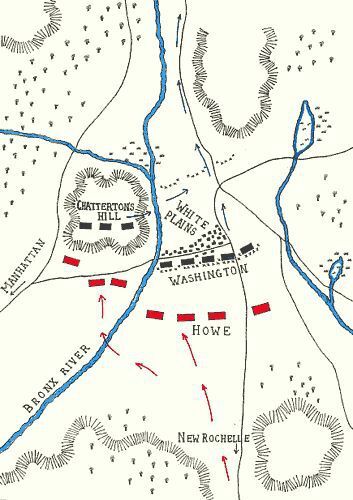 Howe received intelligence that Washington had concentrated his army and deployed it in a large shallow crescent below the village, with the narrow swollen Bronx River protecting the American right flank. 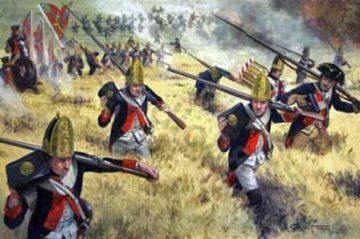 Howe's advance was formed into two columns, one British and the other Hessian. Lieutenant General Henry Clinton commanded the British column and Major General Wilhelm von Heister commanded the Hessians. Washington ordered Brigadier General Joseph Spencer to take 1,500-man detachment and two cannons to block the British in the plains between Chatterson's Hill and Scarsdale. Spencer had the front line manned by the Massachusetts militia and the second line was manned by the Delaware Continentals. At 9:30 AM, once the delaying force made contact with the British, they returned and informed Washington that the British were approaching in two columns along the East Chester Road. Once at White Plains, Howe deployed his army in an open area about one mile in front of the American line. Howe spotted Chatterson's Hill and recognized that it as critical terrain. He planned the main attack against Chatterson's Hill while the rest of his army kept the rest of the American line occupied. While Howe and his command conferred, the Hessian artillery on the left opened fire on the hilltop position at Chatterson's Hill, where they succeeded in driving the militia into a panicked retreat. The arrival of McDougall and his brigade helped to rally them, and a defensive line was established, with the militia on the right and the Continentals arrayed along the top of the hill. After the artillery bombardment, a 4,000-man detachment was sent to attack the American position. First, Howe sent 3 Hessian regiments, commanded by Colonel Johann Rall, across the river, where they took up positions at some ridges about 1/2 mile from Chatterson's Hill. Next, the rest of the attacking force crossed a ford downstream, the made their way up the hill. Finally, the 17th Dragoons were sent on a cavalry charge, the first cavalry charge of the war. Rall threatened Spencer's left flank. The militia paniced and was soon routed but the Continentals put up a stiff resistance before being forced to make an orderly withdrawal. The Americans were driven back across the river onto Chatterson's Hill. With the British now in close proximity, Washington suddenly realized the critical nature of Chatterson's Hill and decided to strengthen it. 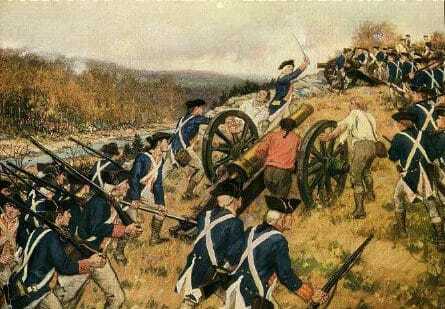 He ordered about 1,600 troops, comprised of Delaware Continentals and Maryland militia to assist in occupying the hill. This brought the hill's total defensive force to around 2,500 troops. Major General Alexander McDougall assumed command of the hill's force. The British regiments attacked directly against the American positions while the Hessians attempted a flanking manuever against the American right flank. The British were forced back with heavy casualties but the Hessians took up a position beyond the American left flank, which was held by inexperienced New York and Massachusetts militiamen. The fight lasted only a few minutes before the militia fled. The fleeing militia exposed the flank of the Delaware troops. The appearance of the advancing Hessians threw the Delaware troops into confusion. Although many companies formed and repulsed several Hessian attacks, pressure against their front continued and the supporting troops were breaking for the rear. Unable to sustain a defense, the remainder of the Delaware troops were forced to make an orderly withdrawal from the field. After the loss of Chatterson's Hill, Washington had little choice but to withdraw farther north, beyond the Croton River, to Castle Hill. At 5:00 P.M., the battle ended. Howe was content to hold onto Chatterson's Hill. On October 30, Howe made plans for a general assault against Washington's army. Heavy rains and winds hampered any further manuevers for both commanders. The two armies remained where they were for two days, while Howe reinforced the position on Chatterton Hill, and Washington organized his army for retreat into the hills north of White Plains. With the arrival of additional Hessian and Waldeck troops under Lord Percy on October 30, Howe planned to act against the Americans the following day. However, a heavy rain fell the whole next day, and when Howe was finally prepared to act, he awoke to find that Washington had again eluded his grasp. On October 31, Washington withdrew his army into the hills to the north during the night, establishing a camp near North Castle. Howe chose not to follow, instead attempting without success to draw Washington out. On November 5, Howe withdrew his army from White Plains and returned to New York City, finishing evicting Continental Army troops from Manhattan. Howe accomplished this task with the Battle of Fort Washington. Washington eventually crossed the Hudson River at Peekskill with most of his army, leaving New England regiments behind to guard supply stores and important river crossings. Later, British movements chased him across New Jersey and into Pennsylvania, and the British established a chain of outposts across New Jersey.